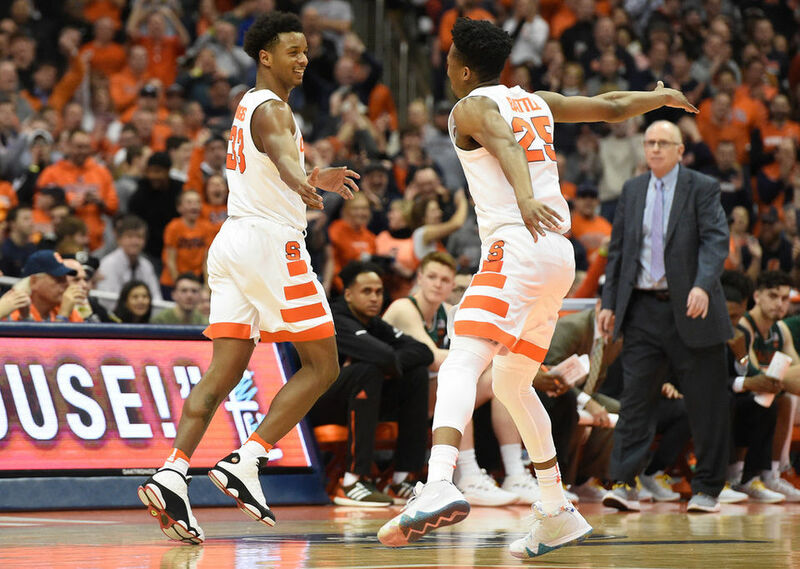 Syracuse took down Boston College 77-71 behind 31 points from Tyus Battle. Whenever BC looked to be closing the lead, Battle pulled up for a contested three and hit. But he wasn’t just looking to score tonight. Battle also had six assists as he looked to get teammates involved and extend the lead. Outside of Battle, Buddy Boeheim tied his career high with 13 points. He did that on 5-7 shooting, including 3-5 from three. He’s quickly becoming one of the most consistent players for the Orange. Oshae Brissett and Frank Howard also had solid games. Brissett finished with 10 points and five rebounds. While it’s not the output Syracuse fans saw from him last year, Brissett is still making a big impact on both sides of the court. But he struggled with turnovers tonight, as BC took the ball away from him on four different occasions. Besides that, he also committed four fouls. He needs to continue to work on those issues as the season progresses. Meanwhile Frank Howard had nine points. Outside of that, he didn’t do a whole lot. He ended with one rebound and one assist, to go along with three fouls. Howard needs to continue to work on regaining his offensive prowess, because the Orange will need him down the stretch. Boston College was led by Ky Bowman and Jordan Chatman who had 21 points apiece. For SU to win this game, it had to contain Bowman and Chatman from three. The two combined to shoot 7-18 from deep. While that’s a solid output, it wasn’t the performance the Eagles needed to take down SU. For the Orange, this is the squads fourth win on the road. Last year, the team finished with just four road wins. With away games against Pittsburgh and NC State coming up, SU has a couple of viable chances to eclipse its road win total from last season. Boston College looked like a team capable of exploiting the zone. In the beginning of the second half, it was clear the team was attacking SU’s defense. BC was passing the ball around the horn, looking for the open three, and hitting. But Syracuse responded and held on to the victory. While this is a team SU should beat, it’s never easy to win ACC games on the road. Tonights win assuredly bolsters SU’s March Madness odds. After a loss to Georgia Tech, Syracuse needs as many victories as it can get over teams it’s projected to beat. Next up, Syracuse goes on the road to take on a young Pittsburgh team looking for revenge.